The Internet equestrian forums and media are abuzz with outrage over this video of Swedish Olympic dressage rider Patrik Kittel riding KWPN Stallion Watermill Scandic in extreme hyperflexion (aka "rollkur"). According to reporters for Epona.tv, this went on for "at least two hours." At one point the stallion's tongue was hanging out and had turned blue, presumably due to lack of circulation because the tongue was caught between the bits. Kittel's solution was to halt, reach down, reposition the tongue so that it was no longer being pinched and then return to schooling in hyperflexion. During the training session, EPONA.tv spoke to a spectator who claimed to have notified one of the show's officials of the prolonged hyperflexion. Odense's Chief Steward confirms to EPONA.tv that a complaint was lodged against Patrik Kittel's riding, but it was not deemed necessary to comment or take action, because Kittel was no worse than other riders using the same method. Kittel, who trains with Dutch chef d'equipe (and Anky van Grunsven husband) Sjef Janssen, went on to place third with a score of 76.250 in Sunday's Freestyle. So the moral of the story is that the FEI doesn't consider it abuse if everyone else does it and you can put up a high score. 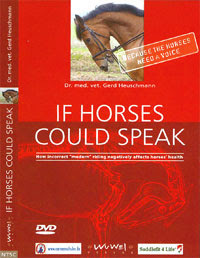 For those readers who haven't had an opportunity to watch the DVD, "If Horses Could Speak," or haven't followed this debate, you can observe in the Blue-Tongue video that the stallion is unable to drop his hind quarters and step underneath his back because the top line (nuchal) legament is streched to the maximum. Also, the extreme head/neck position shortens the reach of the shoulder. The lack of hindquarter engagement and shoulder reach is used to develop the more brilliant, upward leg movement that is currnetly being rewarded by FEI judges in international competition. The irony is that "soring" to create the high-stepping action in gaited show horses is now commonly considered abusive, but use of "rollkur" towards a similar goal isn't. Hat tip to Fran Jurga for not only posting this video on her blog, but for being one of the few equine journalists who have the courage to talk about the practice of rollkur.